Within the establishment of Santal village, Majhi is appointed whose main concern covers up the issue like social, religious and economic issues within the village. He is responsible to establish the exchange of thought of people. 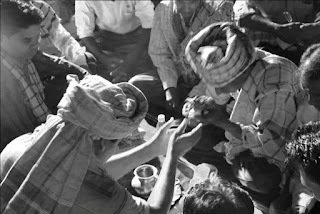 If sickness breaks out in the village or any dispute arises or a tribal offense is committed he can summon the village meeting and presides its discussion. At the end of the meeting, he interprets the sense of village and announces its decision. The decision taken in village meeting is equally the mature outcome of views of its people. Majhi’s decision is considered as a decision of the whole village, where everyone satisfy and convince in a common way. Village represenatives during Santhali Marriage. That’s why the decisions taken by Majhi are always bilateral. It's not something like victory or lose of someone but to reach such a point where the village and both the parties are satisfied and the decision is compatible to them. The philosophy behind this can be understood in the very simple term, like how can a village imagine to be happy or celebrate its festival singing and dancing Santhali folk songs and folk dance while some of it’s people are disappointed and there is some sense of disregarded left among them. So it is very important for a Majhi to keep up these value in the within the village and ensure the prosperity of the village. To understand the self-rule system of Santals, how they govern themselves and how their village council work, you should give a look to this article here: Self-Rule | Santhal Community. One of more duties of Majhi is to look after the ongoing and upcoming events of the village like rites of birth, initiation, and death, marriage, annual hunt, the conduct of year's festival. Because he is chosen by people, he is held as the custodian of village property - the community wells, roads, river, forest and mountain near to them and also the administration of 'Jaher' sacred grove. The common Santal attitude is to regard him as the father of the village and hence sometimes he is also called 'Majhi Baba' the father of the village. At his death, there is often genuine grief and in his memory, a stone is placed inside the hut which was built outside to Majhi house during the foundation of the village. Majhi has a numerous number of role to play, The one among them is ‘Santal Marriage’. In Santhals, Marriage is not a subject that takes place between two families but between two villages. It ties up two villages together and let them form a common way through them. Before marriage, the family informs Majhi about his family’s ongoing and invite him to Marriage. Majhi with his other assistant visit to family’s house, ask about where the marriage has been fixed, Majhi tells his assistant to be present during the marriage process and he himself is also present throughout during the events. One might think that why this interference of village or Majhi is so important in someone’s family matter ? The reason is, as Santhals are very socially organized people. What their ancestors have passed to them is just an organized way of thinking which make common action inevitable among them so that in case of confliction it can still be easily figured out. Does she have anybody there to share her problem who can solve it? Here comes the role of Majhi. Since from the first-day bride becomes familiar to the Majhi of his husband’s village and same with Majhi. Now she can go to Majhi House and explain her problem, Majhi has to take immediate notice he takes this new bride along with him to her house, and first, he tries to solve this within the family. If in case, the bride’s family does not seem to corporate or get convinced. The Majhi then informs this matter to the Majhi of bride ’s village. And through the proper channel of village communication, the bride’s family get the message. If the matter is serious, Both Majhi decides to call for a meeting where both families will have to be present with some of their fellow villagers. And finally, they both reach a conclusion which is usually in the interest of both family and bride too.